Laugh Out London is back for with another night of excellent value alternative comedy headlined by the superb Josie Long. 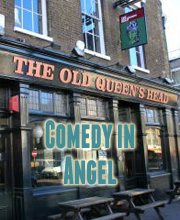 Up and coming stand-up who has already appeared in several competition finals including the BBC Comedy Award and Funny Women. This year she was picked for the Pleasance Comedy Reserve at this years Edinburgh Fringe. Please note Josie Long and Desiree Burch will no longer be able to appear at this show. Original tickets are still valid.